Our Basic Reflexology Classes are covered over 3 weekends and will give you a working knowledge of the 5000 year old therapy of reflexology. You will learn both the benefits and limitations of reflexology. 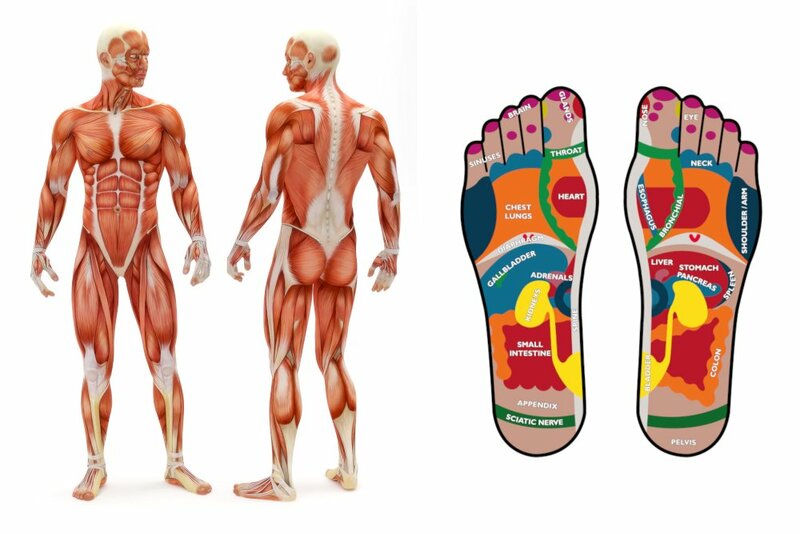 You will learn how to use maps of the feet and hands to administer an ethical reflexology session. You will also learn the following. There are 25 hours of unsupervised documented practice to complete this level. Please Note! The Basic Class does not give you the required amount of hours to take the National Certification Test. You will also need to take our Advanced Class before taking your reflexology certification test. 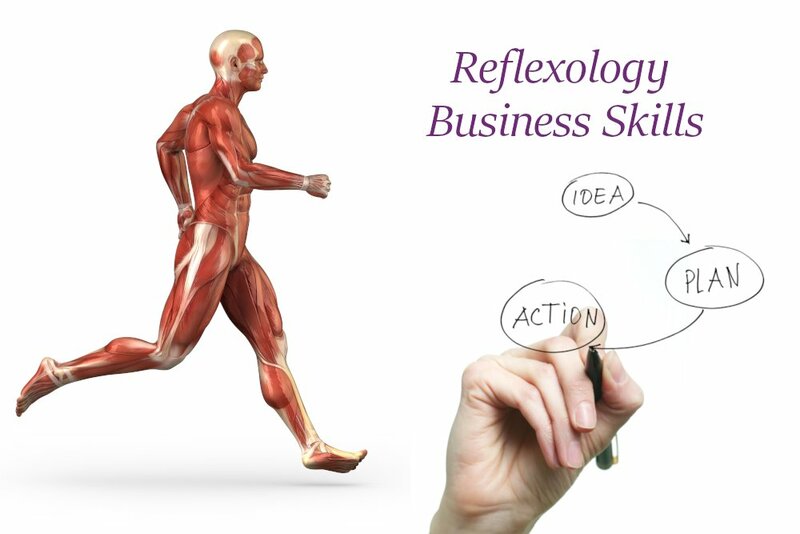 The Basic Class will give you a solid foundation on which to build your reflexology career. Class fee is $325 per weekend. Class size is limited to 10 students so that each students gets the individual attention needed for this life changing skill set. In our Advanced Classes, you will go deeper into anatomy and physiology. We will review what we learned in your Basic Class and learn the importance of oxygen, nutrition, cranial nerves, and the feedback system of the body. In our Advanced Classes, we consider valuable information about developing a business plan and marketing your new business, including setting up your new website, self employment opportunities, insurance, goals, mission statements, and time management. There are 50 hours of unsupervised documented practice to complete this level. Please Note! Completion of our Basic and Advanced Classes will prepare you to take the American Reflexology Certification Board Test. Our Professional Classes are available to any student who has been CERTIFIED from a 200-hour program. This class is designed for a practitioner who wants to take their practice to the next level by understanding the disease process and how it affects each body system. Homeostasis has been disrupted, what can we do to help? All Professional Classes are eligible for 15 continuing ed credits through the NCBTMB and ARCB. In our Professional Classes we will focus on learning how the disease process affects each body system. The focus will be on using our areas of emphasis to help clients get the most from a reflexology session. We will focus on how medication affects each body system and how we can support the entire body throughout the healing process. We will take our knowledge of anatomy, physiology, and pathophysiology and write and try out our own protocols using our areas of emphasis. We will take a look at Therapeutic Touch, Traditional Chinese Medicine and the 5 Element Theory, Essential Oils as well as Acupressure Points on the foot to enhance our reflexology sessions. In our final class (Level 4), we will take our knowledge to one of several sites (nursing home, cancer center, etc) and work on actual clients with one or more health issues. We will incorporate foot and hand sessions and then return to the classroom setting to discuss our experience! Registration is limited to 10 people as massage tables will be used in place of the chairs. When the Professional Course is completed and combined with the Basic, Advanced, Ear and Hand Classes, it will allow students to earn a 300 hour Professional Reflexology Certificate. Are you signed up for the National Reflexology Test? This class is an absolute must to prepare you for taking the National Reflexology Test. It is being held one week before the National Reflexology Test. There will be no exchange of body work, but each student will have time to work with an instructor to practice technique! This will be an interactive class, so come and have fun with us while preparing for your test! Scroll down to view all of our reflexology and continuing education classes. Choose your class type, location and date. Choose your payment option and click Register / Pay Balance. 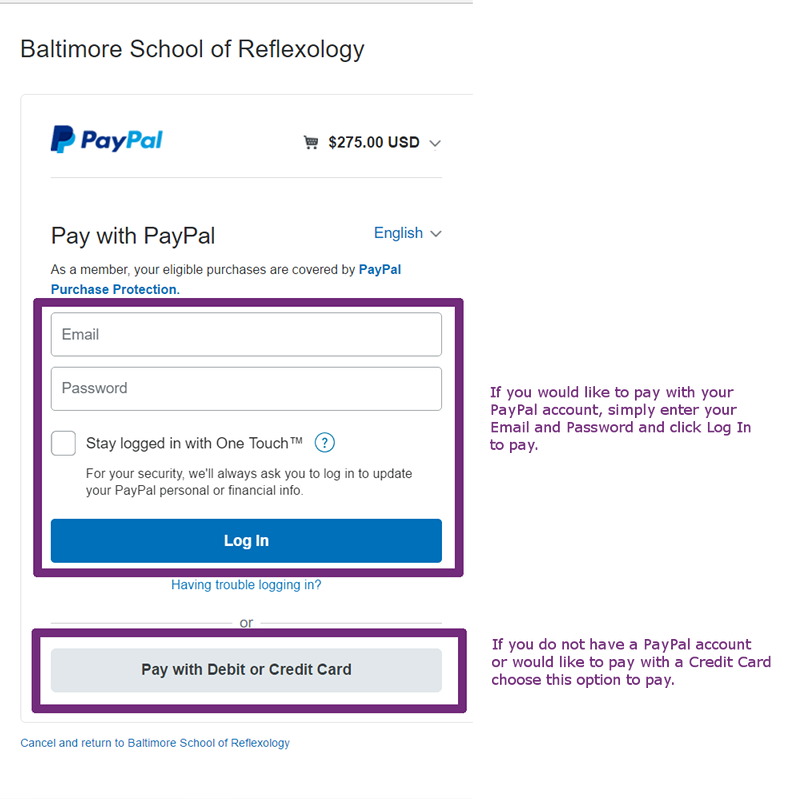 Enter personal info and pay using a PayPal account or as a guest using a credit card. Looking for our Continuing Ed Classes? Click here. Print an application, fill it out and mail to the appropriate address with your payment. LATE REGISTRATION - Registering less than 15 days prior to class date will result in a $15 Late Fee. Late Fee is payable at Check In. REFUND POLICY - $50.00 deposit is non-refundable but may be applied to any other class taken within one year. If you are not able to take your chosen class, the entire class amount is refundable, up to the $50.00 deposit. Deposits not used within one year are forfeited. Get or quarterly newsletter with class updates and more.